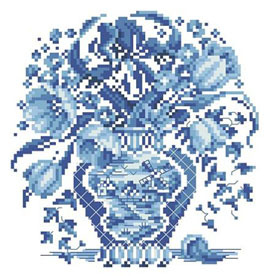 This lovely floral piece is worked in shades of delft blue. Tulips spill over the sides of the vase which has a scene of a windmill on the river’s edge. It would be a good companion to our Windmill Sampler. Contents: Stitch Count 83w X 86h Finished Size on 14 ct: 6" x 6"